The GoPro Hero7 Black is undoubtedly the most powerful action camera the company has created. This year’s updates have made getting professional looking shots easier, rather than bumping specs (for the same price as GoPro’s previous flagship £379), and as a result, we think GoPro has done enough to retain the action camera crown. Hoping to extend its lead in the action camera market, GoPro’s new Hero7 Black brings a host of updates to the already superb Hero6. This year, instead of trying to deliver higher resolution or more frames per second, GoPro has focused on making your videos less shaky. The result is a new technology called ‘HyperSmooth’, built-in electronic stabilisation which allows you to ditch the gimbal and capture smooth, professional-looking footage. You’ll also be getting improved audio, a new ‘TimeWarp’ function, live-streaming built in, and a new gesture-based UI. Yep, this is shaping up to be the best GoPro ever. Perhaps, what’s most impressive of all is that all of these new features have been crammed into a case the exact same size and shape as its predecessor. It’s waterproof down to 10 metres on its own, or you can expand that to an impressive 30 metres with an optional GoPro waterproof housing. Plus, there’s the massive selection of compatible mounts and extras that work with the Hero7 already. One of our favourite features is the ability to record new ‘TimeWarp’ videos, which use the image stabilisation to create handheld, moving timelapses (like you might see in a Casey Neistat vlog). They’re ideal to set the scene, convey time passing, or adding variety to an edited video. The real star of the show is the HyperSmooth stabilisation, which now works on all video upto 4K at 60fps. It works incredibly well, and doesn’t present any of the traditional warping or artifacts found on older GoPros. You can throw your Karma gimbal in the bin. To accompany your improved video, GoPro has also worked on the audio recording capabilities of the Hero7. The built-in microphones are able to capture more dynamic range (deeper lows, higher highs) as well as software which targets and eliminates vibration sounds. Just like the Hero6 there’s a touchscreen on the rear of the Hero7 Black, but the user interface has been completely redesigned. The menus, modes, and settings are now much more simple to use, with intuitive gestures which can be picked up by anyone. You’ve also got voice control, which is really handy when you can’t physically reach the display or are wearing gloves (such as surfing, climbing, or snowboarding). When you connect to the GoPro smartphone app you’ll have another new feature to play with – live-streaming. At launch you’ll be able to send video directly to Facebook Live (via your smartphone’s internet connection) with YouTube coming shortly after. The GoPro Hero7 Black is undoubtedly the most powerful action camera the company has created. 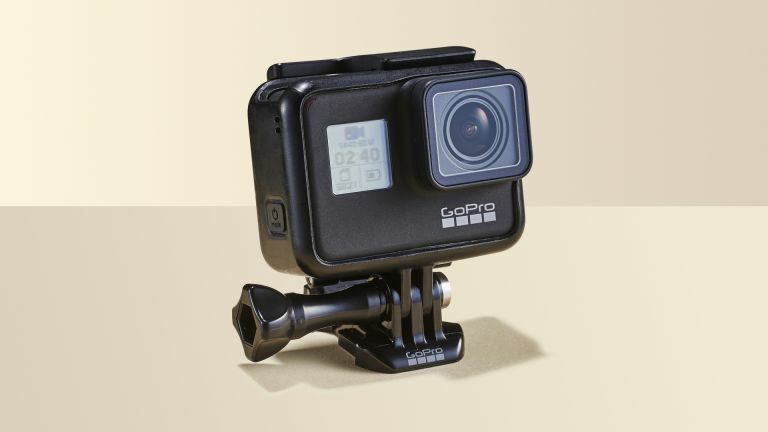 This year’s updates have made getting professional looking shots easier, rather than bumping specs (for the same price as GoPro’s previous flagship £379), and as a result, we think GoPro has done enough to retain the action camera crown.